The election of 1840 had been fought over the economy. The election of 1844 was fought over American expansion. The question of the annexation of Texas had become a political issue. 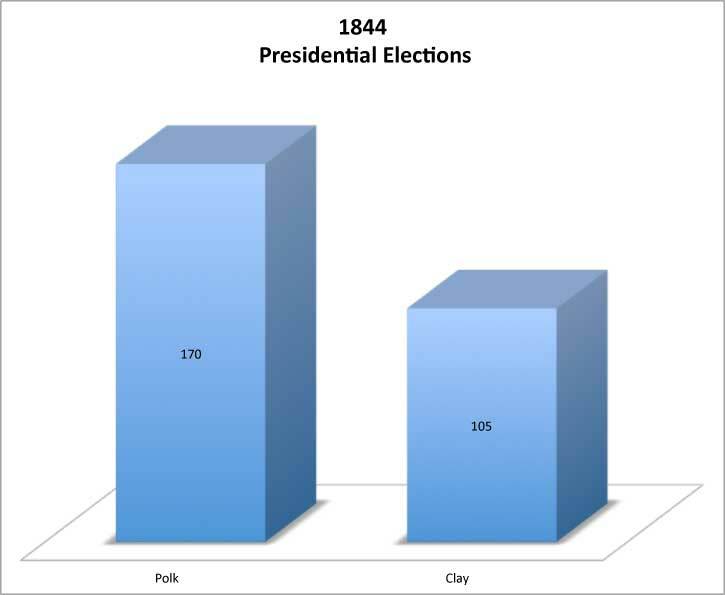 However, both the expected Democratic nominee, former President Van Buren, and the expected Whig nominee Clay, agreed not to make Texas an issue in the campaign. At the Democratic convention, in Baltimore, in May 1844, many Democrats opposed President Van Buren’s position on Texas. Van Buren did not receive the required 2/3 vote. As a result the convention seemed near a deadlock. Finally, on the ninth ballot the convention swung behind James Polk. This was the first time that a dark horse (an unknown) received the nomination. The Democratic party endorsed a platform that called for the annexation of Texas and the reoccupation of Oregon. It also stood against federal improvement and the resurrection of the Bank of the United States. The Whigs nominated Henry Clay, unanimously. In April of 1844, President Tyler had dropped his "Texas bombshell", as it had become known, when he submitted a treaty for the annexation of Texas. This framed the election campaign. Questions of Manifest Destiny and Slavery dominated the campaign. Clay was the early front runner, and expected to have an easy victory. His opposition to the annexation of Texas lost him support in the South. The fact he was a slave owner lost him support in the North. 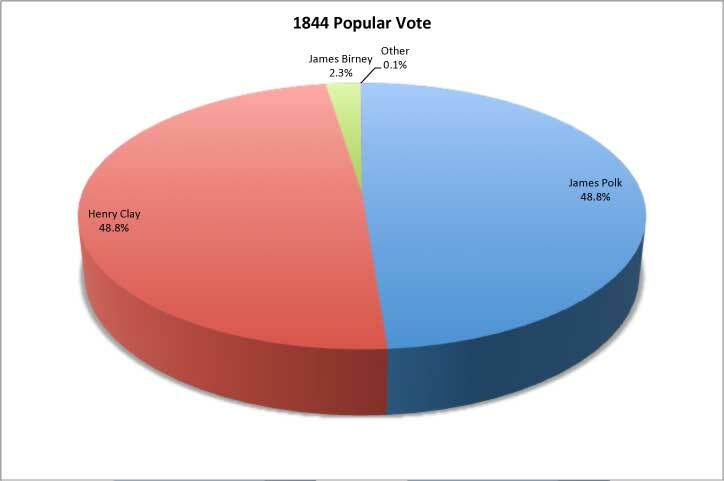 A third party abolitionist candidate named James Birney siphoned off enough support in the North to deny Clay a win in New York, which would have guaranteed his election victory. This election was very personal, with newspaper attacks calling Polk “a coward” and Clay a “drunkard”. 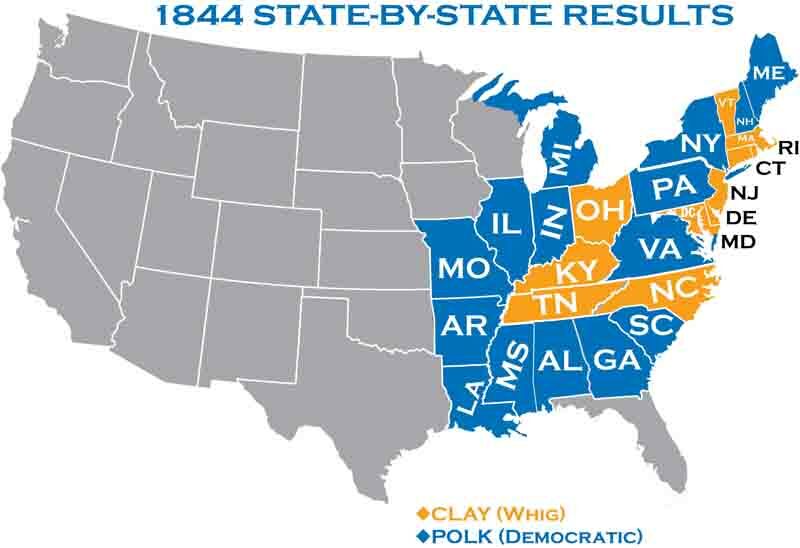 James Polk won the election.